In a small bowl, mix together almonds and sugar and set aside. Spray 8x8 baking pan with canola oil. In a large bowl, whisk together oil, sugar, applesauce, almond milk and vanilla and almond extracts. Stir dry ingredients into wet until combined. Combine blueberries with a pinch or two of flour so they don’t settle at the bottom of the cake. Gently fold blueberries in to batter and discard the excess flour. Spoon batter into pan and make sure it’s evenly distributed. Sprinkle topping onto cake. Bake 28-30 minutes or until toothpick inserted in center comes out clean. Let cake cool completely in pan on rack before cutting and serving. You can store leftover cake, covered, in the baking pan for up to 2 days. Max has never been very keen on school, so his wanting to “get serious about school” was a big deal. Each morning since he was in preschool, I’d practically have to wrestle him out of bed to get him to school on time. For a few months when he was 6, he would pretend to be dead when I came in to wake him. He was extremely convincing. One morning I began reading the definition of fart from the dictionary in a really nerdy voice. It’s hard to pretend to be dead when you’re laughing. And, if you’re not dead, you must get up and go to school. This worked well for a few weeks, then I had to do it in a French accent, then as various cartoon characters, then as my mother-in-law. All good shows eventually close, and after he no longer found his grandmother’s worldview on flatulence entertaining, he went back to pretending he was dead. I found this funny and I admired his commitment, so it was impossible to be angry with him. Whenever I would get angry at Max he would completely disarm me with humor. He knew what made me laugh and he’d wield it like a sword whenever I tried to discipline him. When I was pregnant, I wanted a healthy child, of course, but I also wished for a funny child. The thought of a child with no sense of humor was just unbearable. I got what I wished for. When Max was 7, he cut his head open and had to get staples. Whose bright idea was it to replace stitches with staples, anyway? When he went to have the staples removed, he wouldn’t allow the doctor near him. Rather than use the human-kindness tactic, the doctor, whose patience could have filled a thimble, sternly told Max that if the staples didn’t come out, he would get a brain infection and die. Max looked at me, and we both started howling. We were laughing so hard I didn’t catch a word of the tirade the doctor launched at me before angrily exiting the exam room. When things calmed down a bit, the nurse removed the staples. For weeks afterward, Max continued to find the deadly brain infection hilarious. The one thing I didn’t consider when I was making a wish list for the kind of child I’d get is the eating factor. Max is the only child I’ve ever met who doesn’t like cake. This has to be a genetic anomaly. There is no one in my family or Dan’s who refuses cake. After almost 17 years, I’ve finally made my peace with this. Max can mimic perfectly just about anyone he hears and quip with the best of them, but he will not abide a birthday cake. Max brings me the gift of laughter every day. I consider laughter more valuable than straight A’s, excellence in sports or any of the other myriad things by which we gauge our children’s contribution. For me, sense of humor trumps love of cake any day of the week. Entenmann’s Louisiana Crunch Cake was my inspiration for this cake, and, nope, Max won’t eat that, either. In case you’ve never eaten the Louisiana Crunch Cake, it’s a moist yellow cake that’s sort of Bundt shaped, and it’s covered with this crunchy-sweet glaze. It’s delicious and filled with so much crap I’m kind of embarrassed to admit how much I love it. I decided to go with more natural ingredients here. Sweet, in-season blueberries are the key to success. In February I made a version with blueberries that were from some foreign country, and I might as well have been sucking on a crumb-filled lemon. Hit your farmers’ market for the blueberries. You might be able to pick up some raw almonds there, too. 1. In a small bowl, mix together almonds and sugar and set aside. Preheat oven to 350°F. Spray 8x8 baking pan with canola oil. 2. In a medium bowl, whisk together flour, salt, and baking powder. In a large bowl, whisk together oil, sugar, applesauce, almond milk and vanilla and almond extracts. Stir dry ingredients into wet until combined. 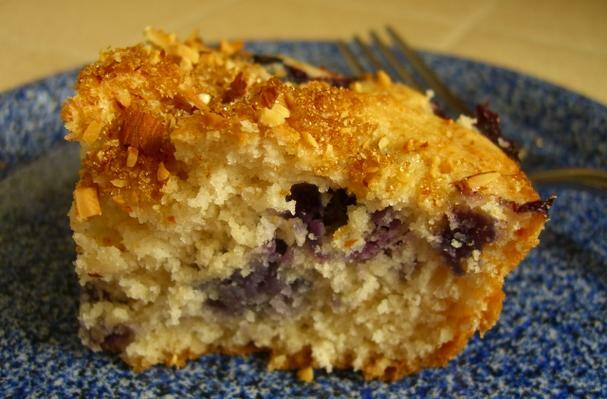 Combine blueberries with a pinch or two of flour so they don’t settle at the bottom of the cake. Gently fold blueberries in to batter and discard the excess flour. 3. Spoon batter into pan and make sure it’s evenly distributed. Sprinkle topping onto cake. Bake 28-30 minutes or until toothpick inserted in center comes out clean. Let cake cool completely in pan on rack before cutting and serving. You can store leftover cake, covered, in the baking pan for up to 2 days.